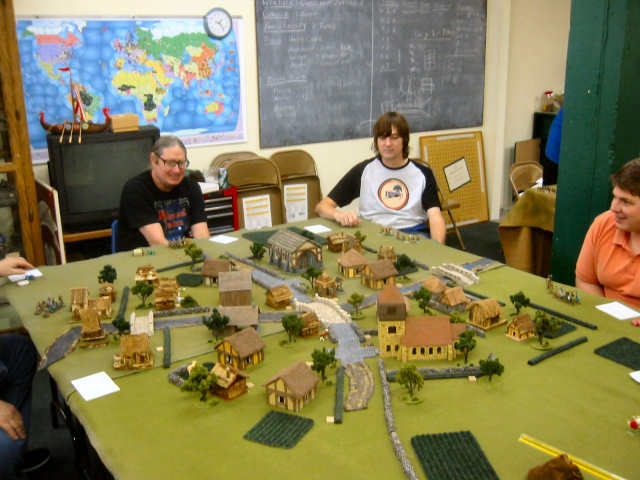 This article describes a "Pillage the Village" Pig Wars scenario played at Great Hall Games in Austin, Texas on 2004/10/17. 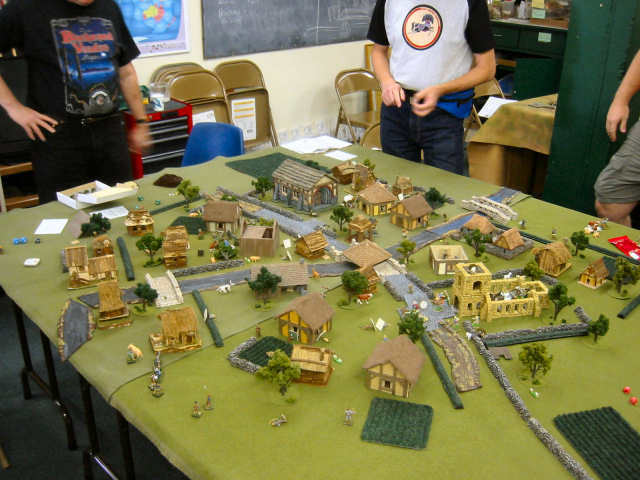 The game followed the Pig Wars Dark Age skirmish rules by Tod Kershner, with changes as outlined in the "Pillage the Village" Scenario Rules by Dan Becker. Mainly these changes use Michael Miller's Dice Based Pig Wars Chart which relies on a D10 and D6 rather than playing cards. 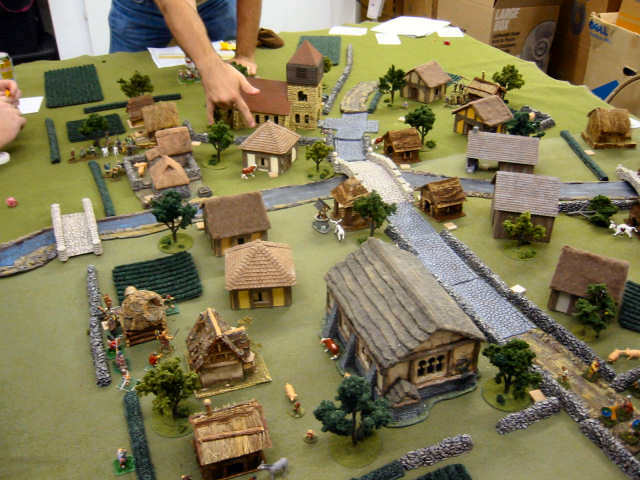 In this scenario players must raid a guarded town village, capture livestock and prisoners, and avoid angry villagers and town guards. The player who captures the most loot with the least casualties is the winner. Notice for this scenario that we had a rather large village, almost a Dark Ages city, owing to the rather generous scenery contributions of the Great Hall Games store and the participants. We even had two churches in this scenario, a yellow stone Norman church on the north side, and a grey stone Saxon church on the south side. The village was divided by a river, and there were plenty of hovels, barns, and other huts to raid. This photo shows the village from the south end. Dan the angry Viking points to a rendezvous point on the north side. He and Lance, both being Vikings, decided to have a non-aggression pact towards each other - toward the villagers, that was a different story. The Saxons and the Welsh entered from the right side. The Scots headed straight up the main street from the lower right side with a mad sprint up the old Roman road. The Isle Men invaded the village on the lower left while the Vikings entered from the upper left. Here's an interior view of the Saxon Church on the south side. The Isle Men entered and encountered 7 angry villagers and Town Guards. Although one of the locals lies dead, so do two of the Isle Men. The Isle Men retreated from the church, chased by the angry locals. Unfortunately more raiders waited and killed the locals outside. Here the Saxon elite have stormed a house. The King, his Son, and two Huscarls have kicked in the door, only to be greeted by two angry villagers and one Town Guard. 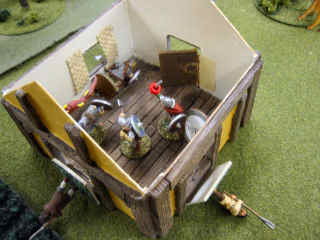 The Town Guard kills a Huscarl and wounds the King, but the angry villagers have been killed and hurled out the windows. Eventually the King kills the Town Guard. No gold and hence no victory points in this hovel. Three Vikings storm the yellow Norman church and find an angry farmer (in black) and his 5 sheep. The farmer is killed and most of the sheep eventually are captured. One sheep hops out the window and runs away. 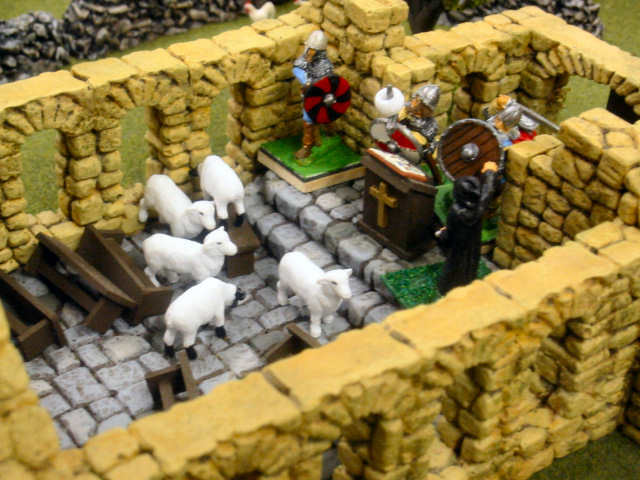 Later the Vikings find a docile villager and his cow in the belfry. How he got the cow up there, no one knows. This church turns out to be the hiding place for many of the village livestock. In front of the church another battle ensues. One angry female villager killed off three of the Viking bondi archers. Fearing total annihilation, the Viking king had to step in and make an end to the villager. By the end of the game there has been much looting. 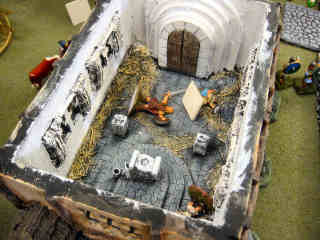 This picture shows how the animals and raiding miniatures have been scattered about the board. On the lower part of the photo, there are the remnants of a skirmish between the Welsh and the Saxons. In front of the yellow Norman church are the remnants of a battle between the locals, the Saxons, and the northern Vikings. Through the village, livestock and other docile inhabitants scatter and flee. There were many more fun stories and ideas for future campaigns. Jason of the Vikings - 71 points, no casualties. Dan of the Vikings - 36 points, 3 casualties. Mike of the Scots - 26 points, 2 casualties. Dan of the Saxons - 15 points, 6 casualties. Lance of the Welsh - 13 points, 2 casualties. Kevin of the Isle Men - 12 points, 8 casualties. The villagers lost about 80 percent of their loot before 4 hours passed and the time ran out. About 1 out of 4 villagers scattered and avoided capture. Thanks to all the players for participating and helping tweak the rules afterwards. We hope to play again and try more scenarios with these rules. Last modified: Thursday, 09-Jun-2011 12:39:00 MST.